A man has been stabbed to death in the street in Birmingham. The victim, 24, was found with stab injuries in Arran Way in the Smith's Wood area of the city at about 23:15 GMT on Friday. 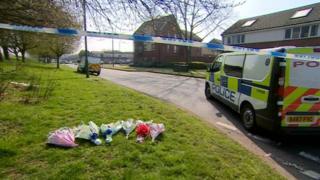 West Midlands Police said the man died at the scene shortly after. Det Insp Michelle Allen said a man had "sadly lost his life", and appealed for witnesses to come forward. The area has been cordoned off while officers investigate. In February, Chief Constable Dave Thompson said knife crime in the city was "an emergency" and pledged extra patrols and officers. According to the Home Office, the West Midlands had the third highest level of knife crime offences per head of population between the start of April 2017 and the end of March 2018. Home Secretary Sajid Javid spoke last month about being "very concerned" about knife crime in Birmingham.